Even better than the real thing. Luxe lashes. Crafted of super premium silk, these fur-free falsies look so natural for every day, no one will bat an eye at your newly lush fringe. 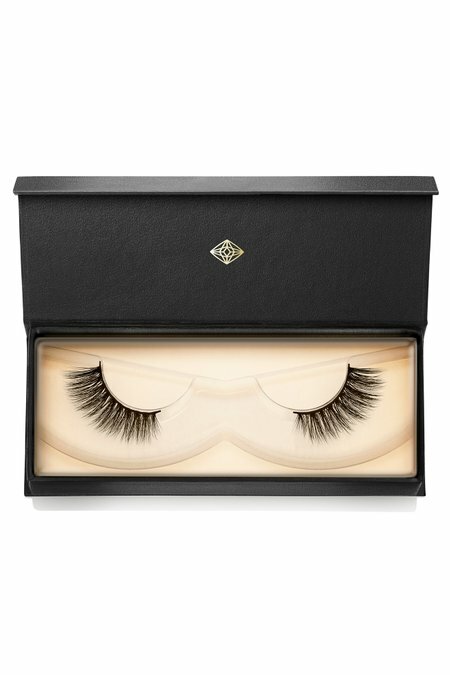 Lighter and softer than real mink lashes, these fabulous faux are layered for a 3D effect with a beautiful, lasting curl. HANDLE WITH CARE: Gently remove lashes from their tray with hands or tweezers, lifting from the glued tabs at each end. MEASURE AND TRIM: Using our Lash Applicator Tool, lift the lashes to your lash line to measure. Trim the glued tabs, and excess lash from the inner corner. GLUE APPLICATION: Using our Visionary Lash Glue, apply a thin line of glue to the lash band with the brush applicator. Apply an extra dot at each end and at the center for an extra strong hold. LASH APPLICATION: Once the glue has become tacky using our Lash Applicator Tool carefully place the lashes at the base of your natural lash line. Using our Lash Applicator Tool, adjust and hold lash down to secure. REMOVAL: Using an oil-free and cotton swab, lightly dab along the lash band to soften the glue. Once loose, gently remove lash and store in its original case for safekeeping. TIP: For your Lash Star Visionary Lashes to have the fullest life, refrain from applying mascara or exposing them to water.